Demonstration applications for small creeksheds in the Cowichan and Comox valleys on Vancouver Island have been undertaken by the Partnership for Water Sustainability in British Columbia to show how local governments would apply EAP to understand what the ‘water balance (ecological) services’ provided by nature are worth. The way communities have historically developed and drained land has disconnected hydrology from ecology. The consequences of this disconnect are more erosion and flooding, loss of baseflow and aquatic habitat, and an unfunded infrastructure liability for stream stabilization. Traditional approaches and practices are not leading to restoration of hydrological function. Alternative approaches and practices are urgently needed. Local governments need ‘real numbers’ to devise asset management strategies and deliver outcomes that account for nature’s services. 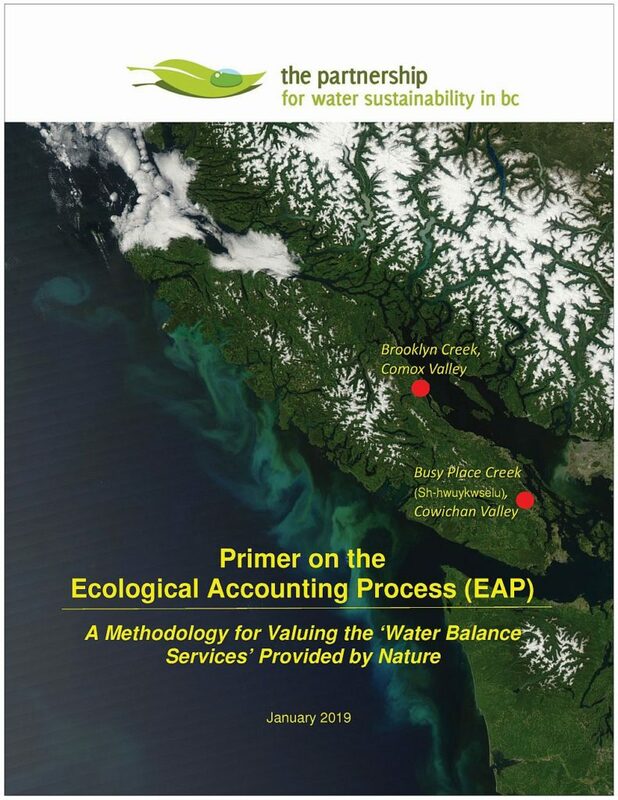 To help communities map a path forward, the Partnership for Water Sustainability in British Columbia released the Primer on the Ecological Accounting Process (EAP) in January 2019. The Primer introduces a valuation methodology that uses readily available financial information from the BC Assessment database. The methodology yields an asset value for the stream corridor. This value can then be used for budget purposes related to asset management. EAP does not require special competence. It can be applied by local government and community collaborators. “The EAP demonstration application process has been a fruitful journey for the project team and collaborators. Along the way, our collective thinking evolved. We broke new ground with EAP. Insights and understanding that we gained are shared in the Primer on the Ecological Accounting Process,” continues Tim Pringle. “These insights led us to look at creeksheds differently. The importance of viewing choices through the ‘worth lens’ became clear. In the Primer, we define the ‘worth’ of a creekshed in terms of a package of ecological services made possible by the hydrology. “EAP is underpinned by a simple strategy: approach the problem from a social point of view. What does the community think its ecological assets and services (the natural commons) are worth? Worth will be reflected in investment of time, dollars and services to maintain and manage local ecological assets such as a stream and associated riparian areas. These are natural commons assets. To the extent that a community recognizes and wants to use and enjoy the ecological services, it would invest,” emphasizes Tim Pringle. “It is not the technical-financial approach that allows us to quantify the worth of natural commons assets. Rather, it is how the community uses and understands the available ecological asset that determines the value. In other words, the social context establishes ‘worth’. 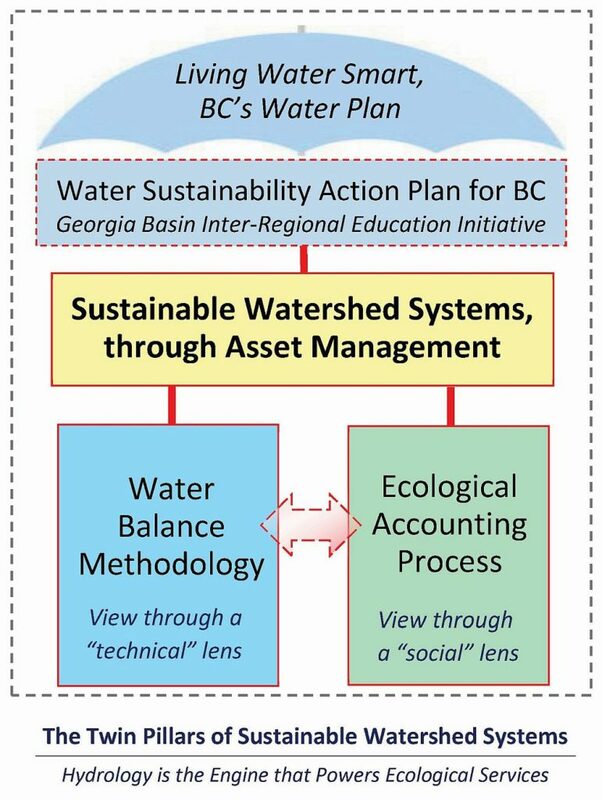 In British Columbia, this is a starting point when we talk about EAP and valuing the package of ecological services made possible by the hydrology of a creekshed. ”Less emphasis should be placed on monetization of ecological services. Rather, it is more realistic to focus on the investment of resources – that is, the actual time and money spent on creekshed restoration – as well as aspirations of motivated intervenors,” concludes Tim Pringle.